Texas CSCOPE Liberal Curriculum is DEAD and SB 1406 PASSED! Never underestimate the power of blogs and grassroots pressure from conservatives in Texas! 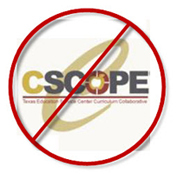 CSCOPE is dead, but as a way to prevent it from coming back with no SBOE oversight, SB 1406 still needed to pass the Texas House. Great News, SB 1406 PASSED THE HOUSE last night after it was announced that CSCOPE lessons were being pulled! We must NOT let our guard down though and the Texas Legislature needs to continue to take action to prevent bad curriculum and an online backdoor curriculum from being introduced into Texas schools with no oversight. SB 1406 was still important, and I am glad it passed because TESCCC announcing they are pulling CSCOPE does not mean they cannot try to start it back up in the future. SB 1406 will help prevent this from happening without SBOE oversight. After CSCOPE was exposed, school districts all across Texas started dropping CSCOPE from being used in their school districts. My hometown of Lumberton, TX was even in the committee process of ditching CSCOPE and researching what will replace it for Lumberton ISD. SENATOR PATRICK ANNOUNCES THE END OF CSCOPE In sudden turn of events the TESCCC Board decides to end CSCOPE lesson plans. AUSTIN-- A letter signed by all 20 members of the Board released this morning stated they will notify their 875 school district clients that all lesson plans will be removed from their website on August 31st, 2013 and that districts cannot use any lessons they currently have beyond that date. The August 31st date corresponds to the notice clause in their contracts with their districts. The letter goes on to say that the Regional Service Centers will not produce lesson plans in the future. The 20 Service Centers will return to their original business plan of providing a management tool for teachers to stay on schedule regarding the teaching of the required TEKS. The official vote will take place at an already scheduled Board meeting on Friday, May 24th.